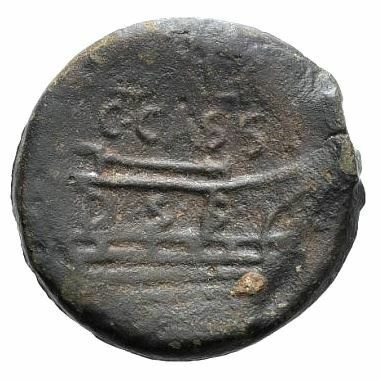 Livius Salinator was one of the moneyers for the year 84 BC. He struck coins jointly with his colleague for the year, C. Cassius Longinus Varus. He later reappears as the Legate for Sertorius in 81 BC. Gens Livia was an illustrious plebeian family at ancient Rome. The first of the Livii to obtain the consulship was Marcus Livius Denter in 302 BC, and from his time the Livii supplied the Republic with eight consuls, two censors, a dictator, and a master of the horse. Members of the gens were honoured with three triumphs. In the reign of Augustus, Livia Drusilla was Roman empress, and her son was the emperor Tiberius. The cognomen Salinator, meaning a salt-merchant, is said to have been given in derision to Marcus Livius, who as censor in 204 BC, imposed an unpopular salt tax.